«The Museum of Eterna's Novel (The First Good Novel) is the very definition of a novel written ahead of its time. Macedonio (known to everyone by his unusual first name) worked on this novel in the 1930s and early '40s, during the heyday of Argentine literary culture, and around the same time that At Swim-Two-Birds was published, a novel that has quite a bit in common with Macedonio's masterpiece. “When the first editor's note appears early in Macedonio Fernández's The Museum of Eterna's Novel, you aren't quite sure it wasn't written by the author in one of his alternate guises. But this is only the beginning of such playfulness. To American readers, Macedonio is not the household name that his former student and self-confessed plagiarist, Borges, has become. Yet his works circle, gambol, and swerve in an eminently familiar way. Macedonio stands (or more likely cartwheels) at the beginning of the Ultraist literary movement that made Borges possible, and his impact on the young Argentinean writer, as well as on later practitioners of experimental fiction, remains undisputed. The Museum of Eterna's Novel, a sprawling, enigmatic work begun in 1925 and "completed" when Macedonio died in 1952, is the fount of that influence. The book's spirit is best captured in its last chapter: the "Final Prologue," addressed "To Whoever Wants to Write This Novel." In fact, prologues constitute almost half the book, bearing such titles as "Prologue of Indecision," "Prologue for a Borrowed Character," and "Prologue of Authorial Despair." These preambles take shape as metaphysical inquiries, character sketches, and desultory lectures on the nature of art, passion, suicide, and (inevitably) prologues. Readers of Borges's Labyrinths, or Calvino's If on a Winter's Night a Traveler, or later self-reflexive novelists such as J. M. Coetzee and David Foster Wallace, will recognize the authorial game—finding new ways to break the fourth wall. Yet Macedonio also stands shoulder to shoulder with the original metafictional prankster, Laurence Sterne. The Argentinian even includes a couple of bare pages for the indecisive reader, perhaps in homage to the blank, black, and marbled folios of Tristram Shandy. The Museum of Eterna's Novel is also reminiscent of that classic of avant-garde Italian theater Six Characters in Search of an Author. In Pirandello's tragicomedy, six strangers show up at a theater rehearsal, claiming they're looking for an author to complete their story. Many of Macedonio's characters are, alas, not even allowed to appear; in addition to "Real Characters," he gives us Nonexistent, Absent, Thwarted, and Awaited Characters and even two Fragile Characters, "owing to their vocation in life, because they believe they can be happy." When the novel proper begins on page 128, we find a handful of Macedonio's creations in an even more metaphysically challenging dilemma than Pirandello's: They have gathered at a luxurious country estate called La Novela, where they must learn "to change from living beings to 'characters,'" guided by a man known only as the President, who is himself in love with Eterna, the beautiful and elusive woman of the novel's title. The episodes that follow are by turns poignant, absurd, philosophical, and banal, as Macedonio's characters move through the rooms of their well-apportioned prison—eating, drinking, flirting, gossiping, and all the while mulling over their fictional natures and discussing what fate awaits them at the novel's inevitable end. Macedonio gives the screw another turn with the entrance of a final character—the Reader—who craves something like the same fate: "Oh, if I could be a fly on the wall for your conversations, and in this way know for even an hour what it is to be a character!" If there are conflicts driving this elusive work, they are surely these: the joy one feels on immersion in literature and, from the perspective of the "active" world, the deathlike stasis of a life lived in books. Macedonio is the sort of writer Ezra Pound would probably have classified as an "originator" rather than a virtuoso—the unwashed literary pioneer who invents a crude new form, which the most gifted of his followers (Borges) hammers into its perfect shape. Yet such a classification would not account for the most compelling feature of Macedonio's work. More than simply providing Borges a springboard, Macedonio's epic, quarter-century-long project is one of the peaks of a genre now rare in this age of irony: the paean to human passion. «Macedonio Fernández apparently began working on The Museum of Eterna's Novel around 1925, and kept on revising it until his death; it was first published posthumously. Regardless, it is and would have remained intentionally fragmentary, a pieced-together game in which some of the pieces might have been replaced, rearranged, or changed but the whole still remained much the same. The work it most closely resembles is the similarly playful and digressive Tristram Shandy. This page is for the reader to linger, in his well-deserved and serious indecision, before reading on. The author's presence (and whatever he is trying to do at any given point) figures in much of the text(s) - and the reader is very much taken into account throughout, too. In fact, Fernández isn't satisfied with merely addressing the reader, but rather draws him - several of them, actually - into the text itself. Yes, it's that kind of book. "I want to know what kind of people I've ended up with here." Another prologue is devoted to two rejected characters, another - 'The man who feigned to live' - is entirely in the form of a footnote. All the events and characters in this novel are pleasantly impossible, they are fantastic with respect to reality. An irritating read, this book will annoy readers like no other, with its false promises and inconclusive and incompatible methodology; nevertheless it's a novel that will not cause reader evasion, since it will produce an interest in the soul of the reader that will leave him allied to its destiny -- it's a novel that needs a lot of friends. My tactic as a novelist is: the Reader only catches glimpses of the characters, but what he comes to know of them he knows so well that he is pricked by readerly irritation. He's left insatiable by his incomplete knowledge or "half-knowledge", yet loves their delicacy. Midway through the book the prologuing is more or less done, but Fernández only partially changes tack. Certainly, the narrative does not become a conventional novel. The characters that have previously been mentioned and introduced are now the central figures, but this is still about fiction-creating. There's a locale -- the estancia "La Novela" -- but in getting their bearings and finding their roles the characters are still very much part of a creative process -- in which they, as well as the author (and the reader(s)) play a role. Yes: The Museum of Eterna's Novel continues to tie itself in self-reflexive knots. I'm anxiously awaiting my turn to descend into the pages of the novel. Am I not there yet? This novel is enamored of itself and it is the sort of novel where mishaps and adventures happen, artistic indecisions, whether to get lost in art, to be silent, to be ignorant; even as it relates events it is swept away by others; it contains accidents and is the victim of accidents. Fernández tries to have (and do) it every which way; it is fascinating -- especially in its details (or rather: its tangents) -- but it also proves utterly exhausting. Ever since I've been an author I've looked on in envy at the audience there is for auto accidents. I sometimes dream that certain passages in the novel had such a throng of readers that they obstructed the progression of the plot, running the risk that difficulties and catastrophes of the interior of the novel would appear in the forward, among the mangled bodies. Fernández may be too enamored of such auto-accident passages: certainly there's a great deal here that stops one in one's tracks -- yet like gawking at a car accident, what can be taken from it is often limited, the disruption to the normal flow of life (or, in this case, of the text) ultimately memorable only as disruption and little else. Fernández also obsesses about his readers, suggesting the different forms of reading possible here - and of readers, from the 'window-shopping'-one to 'the reader who skips around'. He even draws some hypothetical readers into the text itself, turning them into characters. And when he writes: "I'm confident I won't have a single orderly reader. An orderly reader could bring about my downfall", it's also because he has done his best to ensure that The Museum of Eterna's Novel can (or should) not be read in orderly fashion. «In this extraordinary literary creation, Borges’ mentor, Macedonio Fernández, masters in the reader's playful engagement to games of the word and of the mind beyond literature and metaphysics. One of the great Argentine writers of the twentieth century, Macedonio (as he preferred to be called), wrote this novel (or anti-novel) with an originality and perversity second to none—way ahead of his time and beyond the avant-guard rupture with previous conventions. He redefined the genre and influenced the great literary geniuses among Hispanic-American writers, including Jorge Luis Borges, Julio Cortázar, Ricardo Piglia, and many others. 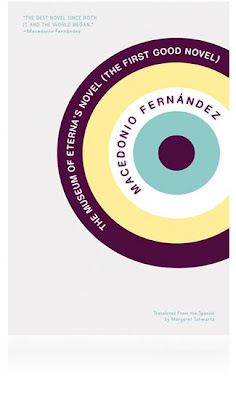 «The Museum of Eterna’s Novel by Macedonio Fernández is engaging and hilarious, light-hearted and profound. The one non-contradictory aspect of the work is its overt attempt to win the reader’s time, attention, praise, and awe—a goal at which it succeeds beautifully. As the author himself describes it, “This will be the novel that’s thrown violently to the floor most often, and avidly taken up again just as often. What author can boast of that?” The novel is written in a unique form, consisting of dialogues between the author and his readers, which take place over a series of prologues. The Museum of Eterna’s Novel is a meta-novel that goes so deep into the swirl of metas that it loses itself, its characters, and us in the process. And yet it is all about the relationship between reader and author, and what fiction can and cannot do. The Museum of Eterna’s Novel is a proverbial Wonderland of wit and explicitly enunciated confusion, where forward leads backwards, and where a word is synonymous with its opposite. As the novel progresses, Fernández constantly shifts voice and tone in a self-conscious attempt to disorient his reader. Fernández writes in the first of about fifty playful prologues introducing his novel, “Let the Reader take charge of my agitation and trust in my promise of a forthcoming goodbad novel, firstlast in its genre, in which the best of the bad of ‘Adriana Buenos Aires’ and the best of the good of ‘Eterna’s Novel’ will be allied, and in which I will recollect the experience gained in my efforts to convince myself that something good was bad, and vice versa, because I needed it to finish a chapter of one or the other...” He then mentions that he wrote a page of the good novel and a page of the bad novel per day, and sometimes the pages got mixed up. It is now up to the readers, he says, to collaborate and sort out the confusion. Fernández, born in Buenos Aires in 1874, worked on this novel between 1925 and 1938. A philosopher, humorist, writer and poet, he started The Museum of Eterna’s Novel when he was about fifty and rewrote it five times before his death. Fernández was very concerned about writing, but not nearly as concerned about publishing his own work. Among English speakers he is better known, not as an author, but as a character in the works of Jorge Luis Borges. Fernández was a close friend of the South American literary giant, and Borges cites Fernandez as one of his most important mentors and influences. The two share a desire to discover what actually lies at the core of the accepted concepts of time, structure and pattern, and the less accepted ones of metaphysics and the unconscious mind. Borges draws the analogy that in his conversations with Fernández he was like Plato who listened to and transcribed the ideas of Socrates. The ideas of the latter were later used to form a new Argentinean literary movement. This new translation of The Museum of Eterna’s Novel marks the first opportunity for English speakers to read Fernández and encounter one of Latin America’s most influential writers. The translator, Margaret Schwartz, has preserved Fernández’s subversively humorous tone, evident even in the titles of the prologues, such as, “Prologue to eternity,” “Letter to the critics,” “Prologue for a borrowed character,” “Prologue of authorial despair,” “What do you expect: I must keep prologuing,” and “Prologue that stands on its tiptoes to see how far away the novel begins.” The prologues continue for the first 122 pages, until Fernández includes a blank page with the question “Were those prologues? And is this a novel?” The fine print reads: “This page is for the reader to linger, in his well-deserved and serious indecision, before reading on.” What follows on the next page is not a novel but a love poem. When Fernández finally arrives at his novel, it is surprisingly short and just as self-reflexive, centering on a group of characters who live in a place called La Novela. In a final prologue, Fernández once again defies expectations, providing an open invitation for the reader to rewrite the whole thing. «Humans, breathers, those innumerable incessantly stirring the world's air, relentlessly ordering it into your chests, elevating your eternally open mouths to an eternal heaven, beings of the heartbeat and the voice that either brightens or breaks, which perhaps every day demands alternately an end or an eternity, there's beauty to give us all understanding of the Mystery, and to stop all pain. But where is it? Is it in Art, in Conduct, in Understanding, in Passion? In Cervantes, or Beethoven, or Wagner, or in some great delirium: in adoring intonation, dazzled by Walt Whitman's Man? Argentinian author Macedonio Fernández (1874-1952), though largely unknown in the English-speaking world, has been something of a cult figure to several well-known Latin American authors of the twentieth century, including his protege, Jorge Luis Borges. Fernández's adult life began in conventional bourgeoisie comfort until the death of his wife in 1920, following which he abandoned his profession as a lawyer, sent his children to live with various relatives, and drifted through a series of boarding houses. Translator Margaret Schwartz likens his place in literary mythology to the role of Socrates: as the founder of a new, uniquely Argentinian way of looking at eternal things who dramatically influenced ensuing generations, his voice and teachings revealed through the writings of his students. Fernández was also noted for his eccentricities, such as the time he gave away his guitar to a random stranger in the street, and the other time he tried to establish an anarchist colony in Paraguay only to give up after one night of mosquitoes. The Museum of Eterna's Novel was commenced in 1925, went through five drafts, and remained in an unedited, unfinalized state at the time of Fernández's death (similar to another great product of Latin American literature, Roberto Bolaño's 2666). Like his contemporary Louis Aragon, as well as many other writers of the Modernist era, Fernández sought to reinvent the rules of the novel, starting with a very basic premise: Why risk love when death is inevitable? In tackling a question that has haunted countless thinkers before him, Fernández takes a deeply metaphysical approach that influences the very form of his greatest work. Dedicated to the caprices of the "Skip-Around Reader," whom Fernández claims will unwittingly find themself reading in order, The Museum of Eterna's Novel is a work of philosophical metafiction that uses its medium to explore the cosmic complexities of human life and human love. Fernández was of the opinion that Art should not imitate Life. "I want the reader to always know he is reading a novel and not watching the living, not attending to a 'life.' The moment the reader falls into Hallucination, that ignominy of Art, I have lost rather than gained a reader." In fact, the bulk of The Museum of Eterna's Novel is not a novel at all, but a series of prologues, some fifty in total, with titles such as "Prologue That Thinks it Knows Something, Not About the Novel (It's Not Allowed That), But About the Doctrine of Art," "The Essential Fantasmagoricalism of the World," "The Man Who Feigned to Live" (which is one big footnote), and "For Readers Who Will Perish if They Don't Know What the Novel is About." Some meditate on the process of creating The Museum of Eterna's Novel from the perspective of both the author and the characters, including the cook who decided to resign and left the remaining characters with nothing to eat. Other prologues, in dense and difficult but ultimately rewarding prose, set up the mystical underpinnings of the main story. The actual novel takes place on an estancia called "La Novela," owned by the President, who has gathered together his closest friends, including Maybegenius, Sweetheart, The Lover, Simple, the Gentleman Who Does Not Exist, and Eterna, who is both the President's love interest and the personification of idealized beauty and eternal love. There, the characters exist in the moment and only for each other, spending each day in one another's company and speculating on the nature of companionship and eternity. And here we come to the crux of the matter: the definition of "Totalove," the theme connecting all the musings and mind exercises of both prologues and novel. Fernández describes it as "the Highest form of Daydream." It is a rapturous state of passion that prevails only in the present and is the ultimate form of love: for a beloved, for friendship, or for art and beauty. The problem then becomes how to sustain a moment that is only that: a moment. The Action is only one aspect of Totalove. There is also the anticipation, like the weeks building up towards Christmas and the sadness one feels after the presents have been opened and the rest of the day still remains. Once the Action has occurred, there is nothing left but loss or even death. Hence the prologues: The Museum of Eterna's Novel is a novel that doesn't want to begin because in our beginning is our end. The Action initiated by the President is the conquest of Buenos Aires by beauty, which is achieved by eliminating all references to history and the past, including statues of famous men and all homages to the memory of heroic deeds. Streets are given new names such as Peace, Hope, Happiness, The Bride, and Youth. "In the end, something happened to non-flowing time, like history, and there was only a fluid Present, whose only memory was of what returns to being daily, and not what simply repeats, like birthdays. That's why the city almanac has 365 days with only one name: 'Today,' and the city's main street is also named 'Today.'" But the Action fails to bring fulfillment to the President and his relationship with Eterna. He is unable to achieve Totalove and the result is a gradual break-up of La Novela and the final good-bye between all the characters. I realize you may want me to continue on, Fernández assures the reader, and force me to bring good tidings to all these characters you have fallen in love with, but Posterity likes tragedy and not comedy, and thus, we too must reluctantly take leave. «In 1921, a well-to-do Argentine family arrived in Buenos Aires on a grand transatlantic ship, the Reina Victoria Eugenia. If they were on deck to watch the city come into view after seven years in Europe and a three-week ocean crossing, they would have first seen the curved art nouveau facade of the Argentine Yacht Club at the port’s entrance, its spire evocative of a lighthouse; then they may have noted the belle epoque customs house, which rose higher than the loading cranes and warehouses of the Dársena Norte port complex; and finally, once they arrived at the passenger pier, they would have seen the crowd eagerly awaiting the ship. On that pier, if we are to trust the memory of Jorge Luis Borges, began the most pivotal friendship in Argentina’s 20th century literary history. The family on the ship was Borges’s: along with him traveled his father, mother, sister, and paternal grandmother. Among the friends and relatives waiting to greet them was one Macedonio Fernández, a longtime friend of Borges’s father who had graduated with him from the University of Buenos Aires law school. This Fernández may have been a lawyer by education, but he was a writer and philosopher by inclination, and had been recently widowed—all circumstances that would contribute to his affinity for the 22-year-old Borges, whom everyone called “Georgie.” Likewise, no one ever referred to Fernández by his last name; he was known by his beguiling and unusual first name: Macedonio. The friendship, though it was definitely most intense in the 1920s and cooled afterward, lasted until Macedonio’s death in 1952. The words Borges delivered in a eulogy at Macedonio’s burial are the most eloquent confirmation of how important this bond was to Borges’s development. “In those years,” Borges said, referring to the 1920s, I imitated him, to the point of transcription, to the point of devoted and impassioned plagiarism. I felt: Macedonio is metaphysics, is literature. Whoever preceded him might shine in history, but they were all rough drafts of Macedonio, imperfect previous versions. To not imitate this canon would have represented incredible negligence. Gabriel del Mazo, Macedonio’s cousin, remembers Borges’s speech by the family crypt for a different reason. It may have been the first time in the history of the Recoleta Cemetery, a decidedly somber if beautiful necropolis, that attendees at a burial burst into laughter. Borges accomplished this by recalling one of Macedonio’s jokes: that gauchos were invented as entertainments for horses. Humor was one of the hallmarks of Macedonio’s writing—a refined and cerebral humor typically flavored with paradox (in one piece he describes a man who is always rushing around so as to be the first one to arrive late). The affinity for the paradoxical proposition is one of the many ways in which Borges took after his old friend, but hardly the only one. Both men were enamored of speculative philosophy, and arguably it was Macedonio who was responsible for making a metaphysician out of Borges. Both writers were incessant explorers of a handful of themes: the inexistence of the individual personality, the elastic nature of time, the permeability of waking life to dreams and vice-versa; one might say: the instability of reality in general. In both writers’ work the supposedly bedrock concepts by which we live are revealed to be unstable isotopes, slippery and layered, none being in essence what they appear to be and all of course eminently moldable, especially within the pages of a story, poem, or essay. For other critics, Borges’s friendship with Macedonio is instrumental, but hardly determinant. They point out that Borges published his famous short stories in the 1940s, a decade or more after the period in which he was closest to Macedonio. Also, Borges’s own reading appetites were omnivorous and prodigious: Who’s to say whether he absorbed this or that idea from Macedonio or from a tome in his own library? Also, they regard the debate as somewhat spurious: even if the fodder for Borges’s iconic short stories like “Tlön, Uqbar, Orbis Tertius” or “The Circular Ruins” came via Macedonio’s influence or idea bank, it’s certainly Borges’s consummate art as a stylist and storyteller that enabled him to fashion flawless prose from the material. Whatever the outcome of this critical debate, if there is one, it’s clear Macedonio left a deep imprint on Borges, one of the 20th century’s great writers. And yet Macedonio Fernández’s name and his work are hardly known outside Argentina. What’s needed is a proper estimation of Macedonio’s legacy; toward this, it’s still useful to examine his friendship with the much better-known Borges, as well as the ideas they decanted together amidst the general intellectual ferment of 1920s Buenos Aires. The flowering of the friendship between Borges and Macedonio was quick and intense. Memoirs of the 1920s recall a cafe in the Once neighborhood of Buenos Aires called La Perla where Macedonio would hold court on Saturday evenings. When not finding him in the cafe, young literary men would visit him at his boardinghouse rooms, where Macedonio would offer visitors gourds of yerba mate as well as cookie-like Argentine confections called alfajores, which he kept stashed in an old suitcase under the bed. More than one memoir recalls Macedonio’s alfajores had a funny tendency to emerge from storage as an unidentifiable blob of crumbs, dulce de leche, and chocolate. Reminiscences also coincide in the portrait they draw of Macedonio: a small and slight but striking man with a dark mustache and flowing white hair, usually swaddled deep in a poncho, fond of strumming a guitar and sinking into silence to meditate upon some point of philosophy, only to emerge from absorption with a brilliant turn of phrase. Borges was among his most assiduous visitors. In those days Borges had a habit of taking endless walks around Buenos Aires, calling on Macedonio at insomniac hours. Almost immediately, the two men began to exchange writing and ideas. The text is worth quoting at length because it is the first published piece of writing Borges dedicated to his mentor, and it already offers all the ingredients of the Macedonio myth that would later (in the view of critics specialized in Macedonio’s work) become a superficial caricature, to the detriment of Macedonio’s reputation as a writer. Borges conjures a romantic image of a wizened hermit, devoted to chess and esoteric speculation, a genius in the raw, who does not even bother to capture his creativity in writing or publish it. The portrait is so compelling it would cling to Macedonio for the rest of his life—and much of his posthumous existence too. Again, those disposed to view Borges’s handling of the Macedonio myth with suspicion believe he too conveniently cast Macedonio as a kind of avant-gardist sideshow, rather than a literary innovator. Only posthumously, with the publication in the late 1960s and 1970s of the major novels Adriana Buenos Aires and Museo de la Novela de la Eterna (Museum of the Eternal’s Novel), did Macedonio begin to shake off this reputation as an eccentric footnote to Argentine literary history. Both novels exemplify Macedonio’s implacable pursuit, similar to Borges’s, of literary forms that went beyond realism and plot, to investigate the bottomless combinatory delirium at the source of art and reality. His Adriana Buenos Aires was an experiment in parodying defunct novelistic forms handed down from gothic fiction and romanticism, while suggesting possibilities for literature light years beyond sentimentalism. Museo de la Novela de la Eterna, first published in 1967 and impossible to summarize, is best described as an extended experiment in writing an open novel analogous to a piece of music. The prose evokes a dizzying world of aesthetic associations and possibilities in the reader’s mind. At every moment it tests the limits between art and life, reality and fiction, as well as form and content. Macedonio’s novels do not satisfy on a narrative level as Borges’s stories do, but instead engross us with their constant tinkering under the hood of fiction. They suggest a workshop full of previously unimagined literary contraptions. Even if most of these do not quite make it out of the garage, they still make mind-opening exhibits for anyone with time to visit Macedonio’s museum: a kind of early 20th-century World’s Fair for possible literatures. The two men definitely had divergent artistic temperaments. Essentially, Macedonio was erratic and impassioned; Borges was methodical and restrained. Borges’s essays and short stories are painstakingly crafted and famously flawless, each carefully prepared for publication. Macedonio spent decades prolifically recording his thoughts and composing wildly experimental novels, but published only three books in his lifetime: a brief meta-novel, a collection of humorous writing, and a compendium of speculative philosophy. What united the two men more than anything else was their proclivity for metaphysics, their unflagging interest in examining the nature of reality, the mystery of being, the fabric of time and space. Extrapolating from this line, we can imagine many long nights of yerba mate drinking in which the two men engage in metaphysical flights of fancy while not forgetting to periodically descend to earth and talk about their troubles and frustrations. In short, they did what male friends do—banter endlessly, about everything under the sun. This level of intimacy seems to have lasted until 1928. By this time, Borges had begun to distance himself from his early avant-gardist tendencies, meaning he already would feel less rapport with the perennially iconoclastic Macedonio. For his part, Macedonio had just published his first book, the collection of metaphysical texts No Toda es Vigilia la de los Ojos Abiertos (Not All Is Vigil with Open Eyes), and would have been particularly sensitive to any literary cross-currents. Some books by and about Macedonio This lukewarm appraisal enraged Macedonio’s disciples, who by that time did not include Borges among their inner circle, and they began to lump Borges together with his brother-in-law on the enemy side. One Macedonio devotee, Leopoldo Marechal, fired off a plucky response to the article. In the course of arguing that Macedonio’s influence over the new generation was hardly diffuse but ubiquitous and thorough, he also makes a pointed reference to Borges as Macedonio’s “spiritual son,” who perhaps could do a better job honoring his progenitor. The spat carried over into other literary magazines, with Macedonio partisans here and there accusing Borges of a less-than-scrupulous appropriation of the older writer’s ideas. As one writer put it Borges was playing the role of an “unconfessed Plato” to Macedonio’s Socrates. For anyone who has a passing familiarity with Borges’s career-making 1940s story collections Ficciones and The Aleph, the two statements above will strike a chord. Simply taking Macedonio’s propositions, and slightly reformulating them, one might come up with a one-sentence summation of many of Borges’s famous stories: they portray reality as endlessly mercurial and death as something slightly other than what we might make it out to be. ...time, space, causality, matter, and I, are nothing, neither forms of judgment or intuitions. The world, being, reality, everything, is a dream without a dreamer; a single dream and the dream of one alone; therefore, the dream of no one, and that much more real to the degree it is entirely a dream. Here, Macedonio is rendering a microcosm of all his metaphysical ideas, much as Borges’s Aleph is a concentration of all points in space at one ultimately indescribable spot. If reality is a dream of “one alone,” as Macedonio’s essay claims, then it is is also the dream of “no one,” though this may at first appear paradoxical. In Macedonio’s world the individual personality does not exist; in his conception, reality as we know it is best described by what he elsewhere calls an “almismo ayoico,” or “I-less soulism,” a rush of sensation we only imagine to be connected to ourselves. Among the corollaries of this philosophy is a refutation of death, which Macedonio also explores in this essay. Based on the mystical position he has staked out, the only experience we can know is being in the now. Existence is a succession of present moments and so does not have a past or a future, which are illusions. Since death can only occur in the future, in the moments after we die, or in the past, in the instants or ages before we were born, it follows death does not exist. The Grim Reaper is a phantom we invent to romanticize our lives. This philosophy, derived from a life reading William James, Immanuel Kant, and Arthur Schopenhauer, was unusual in the context of Macedonio’s milieu. It is evidence of Macedonio’s powerful and intuitive intelligence that an amateur philosopher studying on his own would have arrived at these idiosyncratic conclusions, albeit expressing them in lyrical language and without any pretense at academic rigor. The dominant philosophical school at the time in Argentina was positivism, diametrically opposed to Macedonio’s sketch of a radical, I-denying subjectivity. It’s not surprising then that beyond a small circle of writers and artists Macedonio’s ideas were assimilated mainly as eccentric expositions rather than serious philosophical reflections. But clearly, Borges took these ideas seriously, at least as conceptual artifacts that might be induced to produce innovative literature. Whether it was Macedonio’s influence or not, he became in his own right a serious reader of philosophers like Schopenhauer (arguably Borges’s favorite, and Macedonio’s second-favorite after James). Few of Borges’s iconic stories lack a metaphysical inflection similar to that contained in Macedonio’s metaphysical writings of the 1920s. Again, whether these ideas were taken directly from Macedonio or emerged more spontaneously from Borges’s general immersion in the intellectual cutting-edge of his time is a matter for scholars to squabble over. Neither writer believed in originality in art, so in the deepest and most important sense the question is moot. If Macedonio invented Borges the metaphysician, then it is probably just as valid to say Borges invented Macedonio, the literary man. By his own account, until he met Borges and other young writers and artists participating in the Buenos Aires avant-garde, Macedonio was still writing self-conscious poetry mired in fin de siecle conventions. However coy both writers may have occasionally been about influences, they were conscious of the debts owed one another. For Borges’s legions of readers it’s important simply to know Macedonio played a pivotal role in opening the younger writer’s eyes to a wider world, beyond appearances, through veils of illusion. Reading Borges in the light of Macedonio’s ideas enriches Borges, fleshes out the context from which he emerged, and has the overall effect of making Borges more approachable. With Macedonio as a precursor, Borges seems less monstrous, less a preternatural intelligence emerging freakishly in splendid isolation. There is no contemporaneous writer I have read that enjoys as many correspondences with Borges’s writing as Macedonio. With almost every other author, including those in the Argentine canon, Borges seems to offer far fewer point of contacts, or if they are to be found they seem far more subterranean and circuitous. Borges looms large as an influencer, but appears to have no clear genealogy and so remains fixed as a distant, cold juggernaut in the literary firmament. Borges’s writing, so obnoxiously perfect, can seem an impenetrable construction, much like the city featured in his story “The Immortal,” built on a foundation that does “not reveal the least irregularity, the invariable walls not indulging a single door.” After a dose of Macedonio, though, the reader suddenly feels empowered to tunnel in with multiple points of entry. After the title we find hovering above “The Immortal’s” text one of Borges’s characteristically erudite epigraphs, this one from Francis Bacon, which begins: “Solomon saith: there is no new thing upon the earth.” The quote sums up the story’s deeper theme, which is how our notions of history and memory are turned to dust once we consider the mind-boggling ramifications of infinitely elasticized lifetimes: infinite destinies, transmigrating personalities, a leveling of ethics. A popular musical phrase was sung to me by a Romanian woman, and later I rediscovered it ten times in different works and composers from the last 400 years. Without a doubt, things don’t begin; or they don’t begin when they are invented. Or the world was invented ancient. If the world emerged as an ancient thing, as Macedonio says, then clearly, as in “The Immortal,” memory’s depth perception is an illusion, and the distinction between remembering and foreseeing is doubtful. And both Macedonio’s novel and Borges’s short story take this idea of relativizing history into the aesthetic plane as well, where it instantly undermines any conception of authorial importance or artistic originality. Other resonances: in “The Immortal” the protagonist explores a sinister palace, in which stairways’ steps are all of different heights and exhaust him. According to Borges himself, the idea for these irregular stairways emerged tangentially from Macedonio’s most well-known 1920s literary stunt, which seen through the lens of today seems nothing less than a conceptual art piece: his quixotic project to win the Argentine presidency. To support the campaign, which of course never really got off the ground, Macedonio and his co-conspirators (among them Borges) invented a series of subversive pranks. These would supposedly frustrate citizens into voting for candidate Macedonio, who would then ascend to power and deliver them from the disruptions. Among the absurdist tactics conceived: trolley-cars’ handrails would be loosened, small-denomination coins would be minted to be absurdly heavy (recalling the metal cones in Borges’s “Tlön, Uqbar, Orbis Tertius” that fit into the palm of the hand but are nearly too heavy to lift), mirrors would reflect only half the face, and stairways would be constructed so that none of their steps were of equal height.